Ovarian hyperstimulation syndrome remains a serious complication during in vitro fertilization cycles if high dose human chorionic gonadotropin (hCG) is used to trigger ovulation in high responder patients. Though much of this risk is mitigated with trigger using gonadotropin releasing-hormone (GnRH) agonist alone, it may result in lower birth rates. GnRH-agonist trigger and adjuvant low dose hCG has been proposed to improve birth rates, but timing of this hCG support to corpus luteum function has never been fully described. In this randomized, prospective trial, we explore differences in live birth rates and incidence of ovarian hyperstimulation syndrome (OHSS) in high-responder patients undergoing in vitro fertilization (IVF) receiving low dose hCG at the time of GnRH-agonist (dual trigger) or hCG adjuvant at the time of oocyte retrieval. Does the timing of hCG support make a difference? Thirty-four subjects high-responder patients were randomized to receive low-dose hCG at the time of GnRH-agonist trigger (Group 1) and 37 received low-dose hCG at the time of oocyte retrieval (Group 2). There were no differences in the baseline characteristics and outcome of ovarian stimulation between the two groups. There were no differences in the live birth rates between Group 1 and Group 2 by intention-to-treat (14/34, 41.2% versus 21/37, 56.8%, p = 0.19) or per-protocol (14/26, 53.8% versus 19/31, 61.3%, p = 0.57) analyses. There was a slightly higher incidence of OHSS in Group 2 compared to Group 1 although the difference was not statistically significant (3/31, 9.7% versus 1/26, 3.8%). All the cases of OHSS in Group 2 were moderate while the one case of OHSS in Group 1 was mild. For high responder patients receiving GnRH-agonist trigger, low dose hCG supplementation allowed high pregnancy rates after fresh embryo transfer, regardless of whether it was given at the time of trigger or at oocyte retrieval. Dual trigger may be preferable to reduce the risk of OHSS. Ovarian hyperstimulation syndrome (OHSS) is a complication of ovarian stimulation during in vitro fertilization (IVF) cycles. Although the severe form is uncommon, it may result in significant morbidity including hospitalization. Induction of oocyte maturation using gonadotropin releasing hormone (GnRH) agonist instead of human chorionic gonadotropin (hCG) has been shown to be effective in preventing the development of OHSS [1–3]. The short duration of the luteinizing hormone (LH) surge induced by GnRH agonist administration results in defective corpus luteum (CL) formation [4, 5]. This culminates in abnormal secretion of growth factors resulting in prevention of OHSS [6, 7]. However, the unwanted consequence of the defective corpora lutea function is lower pregnancy rates after GnRH agonist trigger [8, 9]. Elective cryopreservation of all oocytes or embryos after GnRH agonist trigger and transfer in a subsequent cycle maintains excellent pregnancy rates [10–12]. Since fresh embryo transfers are still preferable for some patients, it is paramount to design protocols that are safe and effective in optimizing pregnancy rates after GnRH agonist trigger whilst reducing the risk of OHSS development. Studies have shown that the use of intensive luteal phase support with estradiol (E2) and intramuscular (IM) progesterone (P) improves pregnancy rates, but only in a subgroup of patients [1, 13, 14]. Adjuvant low dose hCG along with GnRH agonist trigger protocols have been suggested as a modality to further improve pregnancy rates. Adjuvant low dose hCG can be given at the time of trigger (‘dual trigger’) as either a variable dose ranging from 1000 to 2500 IU based on OHSS risk and body weight [15, 16] or a fixed dose of 1000 IU . It is thought that administration of low dose hCG rescues a small number of corpora lutea and may result in increased pregnancy rates over GnRH agonist trigger alone . In a retrospective review of our GnRH agonist trigger experience in high risk patients with peak E2 < 4000 pg/mL, we found a higher live birth rate after dual GnRH agonist and hCG 1000 IU trigger compared with GnRH agonist trigger alone (52.9% versus 30.9%) . Alternatively, low dose hCG can be given at the time of oocyte retrieval and a dose of 1500 IU has been shown to improve pregnancy rates in high responders after GnRH agonist trigger [17–19]. Given the physiologic plausibility of the dual trigger (GnRH agonist + 1000 IU hCG) rescuing a small number of corpora lutea, we hypothesize that it would improve pregnancy rates, while decreasing the risk of OHSS, compared to administration of adjuvant low dose hCG of 1500 IU at the time of oocyte retrieval. The minimal dose of hCG necessary to support the luteal phase after GnRH agonist trigger has not been established, however, hCG of 1000 IU is so far the lowest dose reported to be safe and effective . The use of adjuvant hCG of any dose after GnRH agonist trigger may result in an increased risk of OHSS and a high proportion of severe OHSS have been reported after the use of hCG 1500 at the time of oocyte retrieval . Although several cases of severe OHSS were reported after the use of dual trigger in high responders, almost all the cases occurred in women with peak E2 levels of > 4000 pg/ml . Moreover, there has never been a comparison done between the two protocols in high risk patients. We designed a prospective, randomized, double-blind, placebo controlled trial to explore any differences between two well established protocols, dual trigger with low dose hCG plus GnRH agonist versus low dose hCG administration 35 h after GnRH agonist trigger at the time of oocyte retrieval in women at risk of OHSS with peak serum E2 o < 4000 pg/mL. We have previously reported the study design, rationale and protocol overview . This study was a single university-affiliated center prospective randomized double-blind placebo controlled trial. The subjects were recruited from March 2013 to December 2015. Approval for this study was obtained from the university Institutional Review Board. Low dose hCG was used under an Investigational New Drug (IND) application to the Food and Drug Administration (IND# 113472). The trial was registered at clinicaltrials.gov (NCT#: NCT01815138). The study had to be terminated prematurely because of difficulties with recruitment associated with changes in staff and study site location. Subjects who were considered at high risk for the development of OHSS by the following criteria were recruited for the study: (1) age ≥ 18 years and < 40 years, (2) normal serum day 3 follicle stimulating hormone (FSH) < 10 mIU/mL (3) diagnosis of polycystic ovarian syndrome (PCOS) or ≥ 12 antral follicles in at least one ovary or serum AMH > 3.5 ng/ml; or (4) patients with a history of high response to gonadotropins. PCOS was defined according to the Rotterdam consensus guidelines . Previous high response was defined as history of cycle cancellation due to high response or history of significant OHSS after controlled ovarian stimulation (COS). To meet final inclusion criteria for the study, all subjects recruited had to have > 14 follicles of over 11 mm in diameter  and peak E2 levels < 4000 pg/mL on the day of trigger of oocyte maturation. Subjects with hypothalamic dysfunction would not be expected to respond to GnRH agonist trigger, and were excluded from the study. On the day of trigger, subjects who had < 14 follicles at > 11 mm in diameter were thought to be at low risk for OHSS to benefit from a GnRH agonist trigger and were excluded from the study. Subjects with peak E2 levels ≥4000 pg/mL were considered too high risk of OHSS for adjuvant hCG and were also excluded from the study. Subjects who were recruited and consented for the study were randomly assigned to one of the two groups in a ratio of 1:1 by means of computer-generated random numbers. Randomization of subjects into the appropriate study groups was performed by the University Institutional Drug Services (IDS) with a series of consecutively numbered sealed opaque envelopes, therefore concealing the sequence of allocation. The study was blinded to both the clinical staff and the subjects. Randomization occurred when subject’s leading follicle was 14 mm in mean diameter. This strategy allowed enough time for the IDS to randomize the patient and prepare the study medications for prompt delivery at the time of trigger. The subjects were randomly assigned to two groups: Group 1 subjects received GnRH agonist (leuprolide acetate 1 mg) and low dose hCG 1000 IU at the time of trigger and then received the placebo at oocyte retrieval (35 h after trigger). Group 2 subjects received GnRH agonist (leuprolide acetate 1 mg) and placebo at the time of trigger and then received low dose hCG 1500 IU at the time of oocyte retrieval (35 h after trigger). Eligible subjects were recruited by the research staff and consented for the study prior to commencing an IVF cycle. The treatment protocol has previously been described . In brief, COS was achieved using a step-down protocol of recombinant FSH (Follistim; Organon USA Inc., Roseland, NJ, United States) with or without human menopausal gonadotropin (hMG; Menopur; Ferring Pharmaceuticals, Parsippany, NJ, United States) in a total dose of 112–225 IU/day. The starting gonadotropin dose was based on age, body mass index (BMI), day 3 FSH, AMH, antral follicle count (AFC) and prior response to gonadotropins, and was determined by their treating physician prior to enrollment in the study. Subjects’ response was monitored during the IVF cycle using serial transvaginal ultrasounds for follicular measurements and serum E2, P and LH levels. The dose of gonadotropin was adjusted according to the patient’s response. GnRH antagonist (Ganirelix; Organon USA Inc., Roseland, NJ, United States) was started at 0.25 mg subcutaneously daily once the leading follicle reached ≥14 mm in diameter or serum E2 > 350 pg/mL and continued until the day of oocyte maturation trigger. Subjects were triggered with leuprolide acetate 1 mg (Lupron; TAP Pharmaceuticals, North Chicago, IL, United States) subcutaneously with hCG 1000 IU or placebo subcutaneously when at least 3 follicles reached ≥17 mm in mean diameter. Serum LH, E2, P levels were assessed the day after trigger to ensure adequate LH surge response to GnRH agonist trigger . Transvaginal ultrasound guided oocyte retrieval was performed 35 h after the trigger injection and hCG 1500 IU or placebo was administered. Embryo transfer was performed 3 (cleavage stage) or 5 (blastocyst stage) days after oocyte retrieval based on embryo quality. Subjects started IM P 50 mg daily and transdermal E2 patches 0.3 mg every other day (Vivelle-Dot; Novartis Pharmaceuticals, East Hanover, NJ, United States) from the day after oocyte retrieval until a negative pregnancy test or 10 weeks gestation. Serum P and E2 levels were measured on day five (+ 5) and nine (+ 9) after GnRH agonist trigger and at the time of pregnancy test, and then weekly until 10 weeks gestation. The dose of E2 patches was increased, if necessary, up to a maximum of 0.4 mg every other day and/or addition of oral micronized E2 (Estrace; Bristol-Myers, Princeton, NJ, United States) 2 mg by mouth twice daily to maintain serum E2 levels > 200 pg/mL. If needed, IM P was increased to a maximum dose of 75 mg IM daily and/or vaginal progesterone gel 90 mg daily (Crinone 8%; Juniper Pharmaceuticals) was added to maintain serum P levels > 20 ng/mL. All subjects were evaluated 9 days after GnRH agonist trigger (mid-luteal) for signs and symptoms of OHSS as well as ultrasound measurement of the ovarian volumes and presence of fluid in pelvis or abdomen. The diagnosis of OHSS was based on the criteria by Golan et al. . Ovarian volume was calculated using the prolate ellipsoid formula (V = D1 x D2 x D3 × 0.523). The mean ovarian volume was defined as the average volume of the two ovaries ((V1+ V2)/2). Sample size was originally calculated based on previously reported live birth rate for each of the two selected protocols. A previous study reported a 24% delivery rate following hCG 1500 IU administration 35 h after GnRH agonist trigger . However, while this was not significantly different from standard hCG trigger live birth rate of 31% , it was much higher than their previous reported clinical pregnancy rate of 6% after GnRH agonist trigger alone . In a retrospective review of our GnRH agonist trigger experience in high risk patients with peak E2 < 4000 pg/mL, we reported a higher live birth rate after dual trigger (GnRH agonist + hCG 1000 IU) compared with GnRH agonist trigger alone (52.9% versus 30.9%) . Based on a 0.05 two-sided significance level, we calculated that a sample size of 41 subjects in each group will provide 80% power to detect a significant difference in the live birth rates between the Group 2 proportion of 0.240 and a Group 1 proportion of 0.529. The original primary outcome was live birth rate. Secondary outcomes included clinical pregnancy and ongoing pregnancy rates and OHSS. Other study endpoints included implantation and miscarriage rates and mid-luteal ovarian volumes and luteal phase hormone profile. Clinical pregnancy rate was defined as the presence of a gestational sac with a fetal pole and fetal cardiac activity on transvaginal ultrasound. Ongoing pregnancy rate was defined as the presence of a gestational sac with a fetal pole and fetal cardiac activity on transvaginal ultrasound which proceeds beyond 12 weeks gestation. In view of the fact that the study was underpowered, the we just report the findings of the study. All randomized subjects were included in the analysis of the primary efficacy endpoint (intention-to-treat analysis). For analyses of other outcome variables, only subjects who were randomized and received the study medication and underwent a fresh embryo transfer were included (per-protocol analysis). Statistical analyses were performed using the Statistical Package for the Social Sciences (Release 24.0; SPSS, Chicago, IL). Chi-square or Fisher exact tests were used for categorical variables where appropriate. Independent sample t-test or Mann-Whitney U was used for continuous variables based on whether the data was normally distributed. A binomial logistic regression was performed evaluating live birth rate between Group 1 and Group 2 controlling for covariates including age, BMI, number of oocytes retrieved, number of embryos transferred and day of embryo transfer (day 3 or day 5). Data are presented as mean ± SD unless otherwise stated. All P values quoted are two-sided, and values < 0.05 were taken to indicate statistical significance. The study flow is presented in Fig. 1. A total of 89 subjects were recruited and consented. Eighteen subjects were excluded prior to randomization. Seventy-one subjects were randomized (Group 1 = 34, Group 2 = 37). 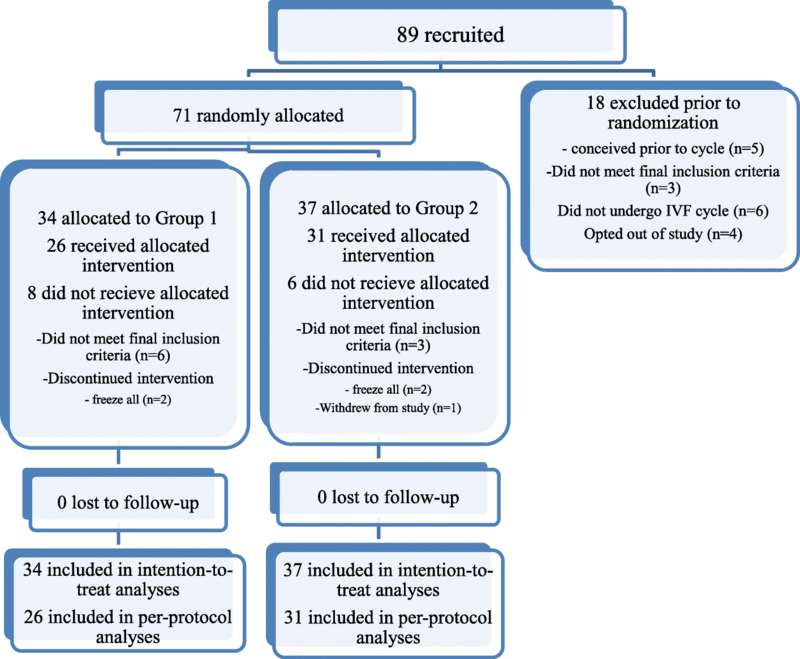 Fourteen subjects commenced treatment but discontinued intervention after randomization. They were included in the intention-to-treat analysis but excluded in the per-protocol analysis (Group 1 = 8, Group 2 = 6). A total of 57 subjects completed study protocol and were included in the per-protocol analysis (Group 1 = 26, Group 2 = 31). The two groups were comparable in mean age, BMI, day 3 FSH, AFC, proportion of patients with PCOS and primary cause of infertility (Table 1). The mean AMH in the two groups was 8.3 ± 5.8 ng/ml in Group 1 and 8.4 ± 4.9 ng/ml in Group 2. The majority of patients in both groups had serum AMH > 3.5 ng/ml, confirming that both groups were comprised of subjects with high ovarian reserve and therefore potential high responders. The outcome of ovarian stimulation is presented in Table 2. The duration of ovarian stimulation and total dose of gonadotropin required were comparable in both groups. A mean of 18.4 oocytes were retrieved in each group, validating that both groups were high responders. The proportion of mature oocytes, fertilization rates, proportion of patients who had blastocysts transferred, number of embryos frozen and proportion of embryos frozen were similar both two groups. The number of embryos transferred was not different between Group 1 and Group 2 (1.5 ± 0.5 versus 1.7 ± 0.5, p = 0.10). The luteal phase hormone profiles are shown in Table 3. There were no differences between the two groups in the serum E2 or P on the day of trigger. There was a rise in serum LH approximately 12 h after GnRH agonist trigger in both Group 1 (from 2.1 ± 1.5 to 75.0 ± 47.3 mIU/mL) and Group 2 (from 2.3 ± 2.3 to 82.3 ± 50.0 mIU/mL), and the differences between the two groups were not statistically significant. All patients in the study had optimal responses to the GnRH agonist trigger, defined as serum P of > 3.5 ng/mL and LH > 15 IU/L post-trigger  and no retrieval was cancelled for lack of surge. There were no significant differences between the two groups in the serum E2 or P levels five days after trigger. The mean serum E2 level 9 days after trigger was significantly higher in Group 2 compared to Group 1, although the serum P levels were not different. There were no differences in the live birth rates between Group 1 and Group 2 by intention-to-treat (14/34, 41.2% versus 21/37, 56.8%, p = 0.19) or per-protocol (14/26, 53.8% versus 19/31, 61.3%, p = 0.57) analyses (Table 4). Subjects who were randomized but did not have a transfer including those who froze all embryos were considered not pregnant in the intention to treat analysis. Upon adjusting for potential confounders using logistic regression analysis, we obtained an adjusted odds ratio for live birth of 0.65 ([95% CI 0.21–2.01], p = 0.45) when comparing Group 1 to Group 2, confirming that there was no difference between the groups. There were no differences in clinical or ongoing pregnancy rates or miscarriage rates between the two groups. The twin clinical pregnancy rate was 13.3% (2/15) and 31.8% (7/22) in Groups 1 and 2 respectively. There was one case of ectopic pregnancy in each group. The incidence of OHSS was 3.8% (1/26) in Group 1 which was not significantly different from the incidence in Group 2 of 9.7% (3/31). There was one case of mild OHSS and no cases of moderate or severe OHSS in Group 1 and three cases of moderate OHSS in Group 2. Additionally, the mean ovarian volume was smaller in Group 1 than Group 2 although the difference was not statistically significant (77.6 ± 57.6 cm3 versus 100.1 ± 60.4 cm3, p = 0.13). The findings of this study suggest there are no differences in live birth rates between subjects who received low dose hCG 1000 IU at the time of GnRH agonist trigger and hCG 1500 given at the time of oocyte retrieval after GnRH agonist trigger. However, this study is underpowered in detecting differences in live birth rates and therefore the results should be interpreted with caution. More cases of moderate OHSS occurred in women who received low dose hCG at time of oocyte retrieval, however, the differences were not significant. In view of the reported low pregnancy rates after fresh embryo transfer [8, 9] and excellent pregnancy rates following frozen thawed embryo transfer cycles after either hCG or GnRH agonist trigger [11, 27, 28], elective cryopreservation of all oocytes or embryos has become an attractive option after GnRH agonist trigger. However, there are some patients who may still prefer fresh embryo transfers because of financial pressures, insurance coverage, or personal considerations. In addition, not all IVF clinics have established successful embryo cryopreservation programs that can provide the same results reported by the more experienced centers. It is therefore incumbent upon us to optimize our luteal phase protocols to improve implantation rates and enable fresh embryo transfers while still taking advantage of GnRH agonist trigger to decrease the risk of OHSS. Corpus luteum dysfunction and early CL demise is the underlying reason for the significantly low pregnancy rates after GnRH agonist trigger. Intensive steroid luteal support using exogenous E2 and P supplementation improves pregnancy rates after GnRH agonist trigger [1, 16, 29, 30]. However, the benefit from intensive luteal support does not extend to all patients triggered with GnRH agonist. Women with low serum LH and serum E2 < 4000 pg/mL have a lower pregnancy rate compared with women with peak E2 over 4000 pg/mL, despite intensive steroid hormone support . Adjuvant low-dose hCG has been proposed as an option to rescue a few CL to improve luteal phase function and improve pregnancy rates without increasing the risk of OHSS [13, 15–18, 31, 32]. Our selection of the time and dose of adjuvant hCG administration after GnRH agonist trigger was based on two common approaches previously described to improve pregnancy rates . The purpose of this study was to determine if one protocol has superior pregnancy rates without increasing the risk of OHSS. We selected a fixed dose of adjuvant hCG 1000 IU at the time of GnRH agonist trigger for the study group (Group 1) based on the assumption that it may be high enough to rescue a few of the corpora lutea to optimize conception rates, but not too high to rescue excessive numbers of CL, thereby reducing the risk of significant OHSS development . The use of adjuvant hCG 1500 IU administered 35 h after GnRH agonist trigger is well supported in the literature with similar pregnancy rates compared with standard dose hCG trigger [18, 31, 32], and was therefore selected as the control group (Group 2). Physiologically, this approach takes advantage of the fact that luteinized granulosa cells obtained at the time of oocyte retrieval after GnRH agonist trigger are viable and have the same potential for hCG rescue as cells obtained after hCG trigger . Therefore, despite GnRH agonist trigger, the corpus luteum responds to a bolus of hCG administration 35 h later. A previous study had compared GnRH agonist trigger and adjuvant low dose hCG 1500 IU 12 h after trigger versus 35 h later and showed a higher clinical pregnancy rate when given 35 h after trigger . Our study demonstrates that both the dose and timing of the two adjuvant hCG protocols were optimal, as evidenced by the fact that there were no significant differences in pregnancy rates between the two protocols. The addition of any dose of hCG may result in a higher incidence of OHSS  and therefore it is essential to select patients who will benefit from adjuvant low dose hCG without increasing significantly their risk of developing OHSS . Those at highest risk of OHSS including patients with > 20 follicles or peak serum E2 > 4000 pg/ml, may be candidates for GnRH agonist trigger alone and freeze all oocytes or embryos, since such patients may have a higher incidence of significant OHSS after low dose adjuvant hCG use [21, 34]. While there were no statistically significant differences in the incidence of OHSS between the two groups, all the subjects with OHSS who received hCG at the time of oocyte retrieval (Group 2) had moderate OHSS in contrast to only one case of mild OHSS in the dual trigger group (Group 1). Moreover, the mid-luteal ovarian volume was smaller in the dual trigger group, although the differences were not significant. Therefore, for the prevention of OHSS, dual trigger with adjuvant hCG 1000 IU at the time GnRH agonist trigger may be preferable without compromising success. Further studies can explore whether this may be due to the lower dose of hCG or the earlier timing of administration. The routine use of dual trigger with low dose hCG may be advantageous since it may ensure retrieval of appropriate number of mature oocytes in cases of failed endogenous response to GnRH agonist trigger and therefore this approach has been used even in oocyte donors and patients who may be freezing all their embryos . In this study, there was no advantage of the dual trigger approach in oocyte yield since all patients had an optimal endogenous hormone rise to the GnRH agonist trigger. Hence, the number of oocytes as well as proportion of oocytes obtained were comparable in the two protocols. A major strength of this study is the prospective randomized nature of the trial. Moreover, the study was double blinded with the use of placebo and therefore the subjects, physicians and researchers were blinded to the assigned treatment groups. All the patients in the study returned 9 days after trigger for an assessment of OHSS, allowing an objective assessment of ovarian volume as well as symptoms of OHSS. The main limitations of the study include the relatively small sample size and also the high number of patients excluded after randomization. We did a post-hoc power calculation which showed that a sample size of 85 subjects will be required to detect a significant difference in the live birth rates per intention to treat between Group 1 proportion of 0.41 and a Group 2 proportion of 0.56. The study is therefore underpowered to determine differences between the two groups. In order to allow enough time for low dose hCG and placebo preparation and delivery during ovarian stimulation but before the day of trigger, we randomized subjects prior to meeting all the final inclusion criteria. It is also possible that the different days and dosages of adjuvant hCG administration do not truly allow direct comparison of dose and timing of adjuvant hCG use. However, we selected these two regimens to perform a comparison between two well established protocols. Although this study may be underpowered to determine differences between the two groups, it has been argued that some information is better than none and that a small amount of inconclusive information may contribute to a larger systemic review [36, 37], particularly when there are no previous trials addressing this specific topic. When sample size is constrained by logistic or recruitment barriers, it has been suggested that reporting the results within these constraints is a sensible choice [36, 37]. Despite the limitations, our study demonstrates that adjuvant low dose hCG administered either at the time of trigger or 35 h later results in excellent pregnancy rates. This demonstrates that either protocol may be a reliable option for patients at risk of OHSS who desire a fresh transfer. While there were no significant differences between the two protocols, a lower dose of hCG given earlier in the dual trigger protocol may be preferable in order to reduce the risk of OHSS development. The authors are indebted to the research coordinator, Evelyn Neuber, PhD, and to MSD for the educational investigator initiated grant. They also thank Dr. Garry Turner, MD and Ruth LaCasse RPh of the University of Connecticut Health Center for their dedication to the DSMB. They also wish to thank the physicians, nurses, and scientific staff of The Center for Advanced Reproductive Services for the teamwork that generated this manuscript. This project was internally funded, with collaboration and some investigator initiated support through Merck Sharp & Dohme. The authors understand and accept article-processing fees. Study design and protocol development: LLE, BSM, LAK, JCN, DWS, CAB, AJD. Data analysis: LLE, BSM, LAK, Subject recruitment: AJD, DWS, LLE, JCN, CAB. Manuscript preparation: LLE, BSM, JCN, DRG, CAB. Manuscript review and submission: LLE, DRG. All authors read and approved the final manuscript. Institutional Review Board approval was obtained from the University of Connecticut Health Center. This prospective study was registered at clinicaltrials.gov. Informed consent was obtained from all study subjects by a member of the research team.